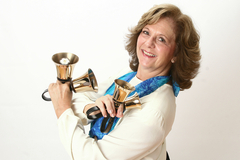 arts administrator and now as a solo handbell artist, workshop leader, and performance coach. at conferences and special events, and for a variety of community organizations. Marie has developed her signature style described as Music in Motion. Nancy Hascall, Sueda Luttrell, Michael Kastner, and Kevin McChesney. local and regional handbell festivals as well as individual choirs, and aspiring solo ringers. representing the United States at the 2006 International Handbell Symposium in Brisbane, Australia. where she also served as an assistant faculty member. and is frequently seen ringing as a substitute is area groups. national magazine Overtones and serves on the Executive Board of Directors for Area 4.
and in her own company to teach leadership, communication, and presentation skills.